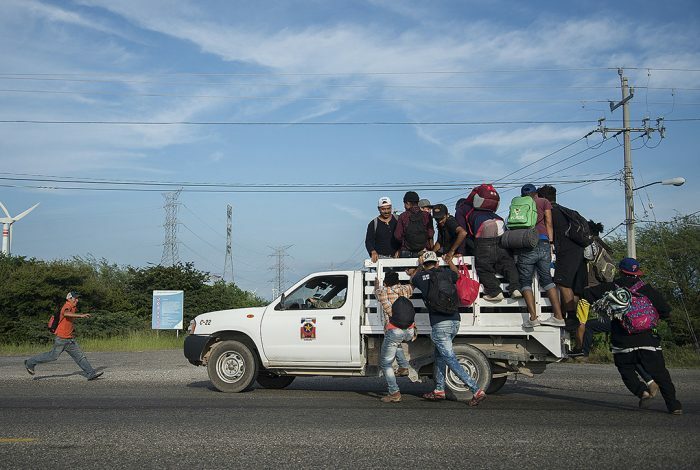 October 31, 2018 - Niltepec, Oaxaca, Mexico - Central American migrants heading to the United States leave the town of Niltepec for the municipality of Juchitan, in the state of Oaxaca, Mexico, October 30, 2018. Juchitan received the Central American migrants seeking to reach the United States, remembering the crisis that they experienced themselves after suffering the earthquake of magnitude 8.2 of September 7, 2017, that left thousands homeless and without family, and that destroyed the symbolic buildings of political, economic, religious, and cultural power of that municio Mexican in the state of Oaxaca. Photo credit: © Luis Villalobos/EFE via ZUMA Press. When President Donald Trump endorses candidates on Twitter, his most direct way of communicating with his base and the public, he usually sends a subtle message to his followers: It’s a scary world out there and only Republicans can protect you. The hope is that, in spite of the personal misgivings many Americans have about their president, they will end up voting for the GOP to keep the country safe. A WhoWhatWhy analysis of all of Trump’s endorsements on Twitter that link candidates to certain positions* has shown that he usually plays on people’s fears for their safety and that of their loved ones and America writ large when he is trying to rally support for Republicans. This is then reliably amplified by his allies in the right-wing media. He touts their stances on “border security” in nearly 70 percent of the tweets in which he combines endorsements with issues and frequently also points to a candidate’s support for the 2nd Amendment (53 percent of tweets), and the military or veterans (68 percent). Far fewer of his tweets reference issues such as taxes (37 percent), jobs (6 percent), or healthcare (6 percent), and he never mentions the environment or education. Trump and his allies in the media keep returning to supposed threats to Americans: Whether it’s a caravan of dangerous (and disease-ridden) refugees about to overrun the US, rampant crime, MS-13 gangbangers, riots over sanctuary cities, or the need for armed defenders in schools and places of worship, the message is always the same: Fear for your lives because the “others” are coming for you. Trump’s vision of (white) Americans under constant attack by outside forces, immigrants, and criminals is not supported by the facts. Crime statistics show that violent crime decreased by 1.7 percent in 2017, a trend that has been ongoing since the 1990s with just a brief increase in 2015. Overall there is no evidence of a national crime wave, and the Brennan Center predicts a 2.9 percent drop in overall crime for 2018. In addition, although you would not know this from watching Fox News, which often highlights the crimes of “illegals,” undocumented immigrants are actually much less likely to commit crimes. Native-born citizens are about 50 percent more likely to commit crimes than undocumented immigrants, and legal immigrants commit about 86 percent fewer crimes. Another study conducted from 1996 to 2010 found that there was less crime committed in areas with large populations of undocumented immigrants. The focus of Trump and the conservative media on the caravan of migrants slowly making its way to the US, hoping to be granted asylum, is another example of the politics of fear. Just in recent days, Trump has suggested that criminals and “Middle Easterners” were mixed in with the migrants traveling from Honduras to the US. And conservative commentators on Fox News have suggested that the migrants were bringing in diseases like leprosy and smallpox. Trump also released a racially and politically divisive ad on Wednesday night. It remains to be seen whether this strategy, which Trump made a staple of his 2016 presidential campaign right from his announcement speech, will be as effective this year. If not, it won’t be for a lack of trying. And if it does work again, expect the president to double down once again on the politics of fear when he is up for reelection in 2020. * Methodology: We looked at all of the Twitter endorsements Trump made during his presidency and, for the purpose of this story, counted those in which he linked his support for candidates to one or more specific issues. That means that tweets in which he endorses one or more candidates but does not mention an issue were not counted. In addition, if he endorsed one candidate multiple times, and cited different reasons for his support, we counted this as one endorsement and added up all of the issues. Overall, Trump endorsed 93 candidates on Twitter. Twenty-five endorsements came without an issue attached and did not factor into this analysis.